We are passionate about conserving Australian native plants, and we regularly promote awareness and education about flora species and their habitats, especially listed threatened flora. We have a Conservation Officer and a Conservation Committee who identify projects and issues where our society can take action and have a positive influence to promote and protect flora species in their natural habitats. The Officer and Committee use their expertise to draft submissions regarding impacts to our native biodiversity from development and other processes. They also undertake on-ground projects to assist objectives to protect endangered flora in the wild, with a recent example being the NSW Saving our Species Program. Our Conservation Officer since 2014 is Dan Clarke. Dan is a practicing botanical consultant with a strong passion for conserving the natural areas in NSW. Dan is happy to engage with any Australian Plants Society member or member of the public regarding flora conservation issues in NSW. The Conservation Officer can be contacted here. 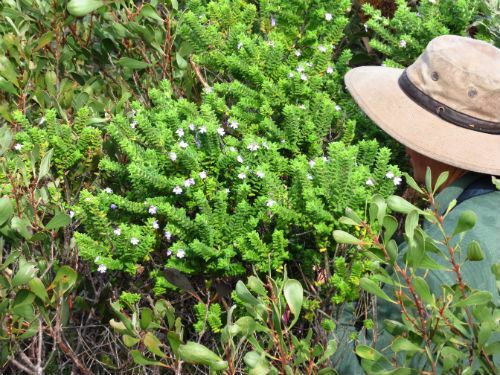 Since 2015, Dan Clarke has coordinated a targeted flora survey by APS members to assist State Government conservation objectives for the threatened plant species Prostanthera densa. This work has been highly appreciated by government bodies. Further threatened species survey work, required by the NSW Saving our Species Program, is planned in 2017 and the coming years. The Conservation Committee consists of Dan Clarke, along with Alix Goodwin, Conny Harris, Margaret Baker and Marilyn Cross who also draft submissions and review conservation issues. Submissions on local biodiversity issues relevant to members are drafted by members with the assistance of the Officer or Committee, or you may choose to bring an environmental issue to their attention and allow them to write the submission for you.